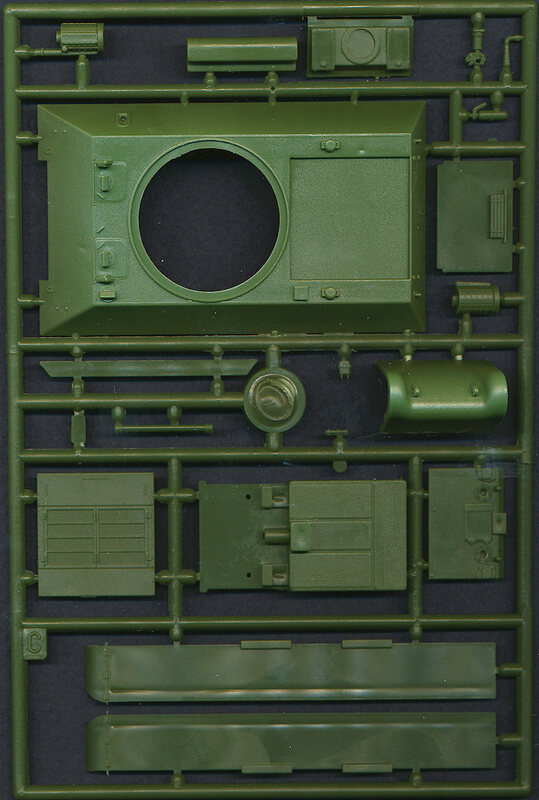 For the most part, I don't find the turret to be as finely made as the previous Achilles turret. 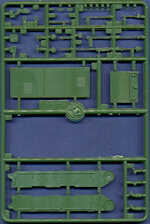 The level of detail is not as fine, and the molding quality has also seemed to have suffered a bit. Notice the horrendous ejector pin mark on the turret roof. Whay wasn't this part flipped around in the mold, so that the ejector pins would have hit it on the inside surface? That was a poor engineering choice. 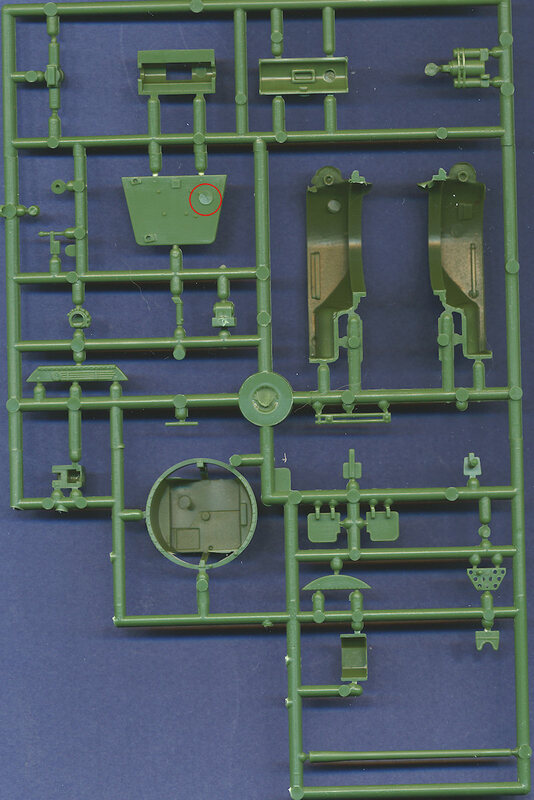 The turret interior has only a limited amount of detail, with a simplified gun breach and turret basket. It would be really nice if an aftermarket company would provide us with a fully detailed turret interior. The shape of the gun barrel is pretty good, but only the single, early design is included. Later barrels (threaded for a muzzle brake) will hopefully be included in later versions of the M36 (assuming UM releases some). One oversight in this kit is the gun travel lock. Or rather, the lack of one. 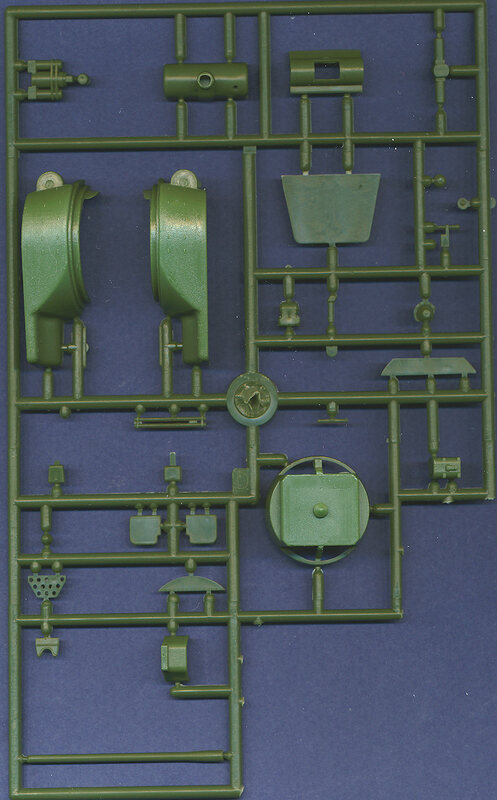 The kit includes the simplified cradle on the rear engine deck as seen on the Achilles, but the M36 had a more complicated, re-designed travel lock which is not included. As before, the vehicle has fully-detailed driver's compartment, but the turret basket will hide the majority of the hull interior. No engine is included. I find it odd though, to go through so much trouble providing a detailed driver's compartment, and yet mold the crew hatches closed, so we won't be able to see most of it. That was dumb. 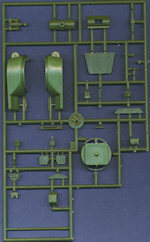 This kit includes the corrected wheel sprue, with the cast, spoked wheels having the correct number of spokes -- 5. The previous spoked wheels had 6 spokes each. 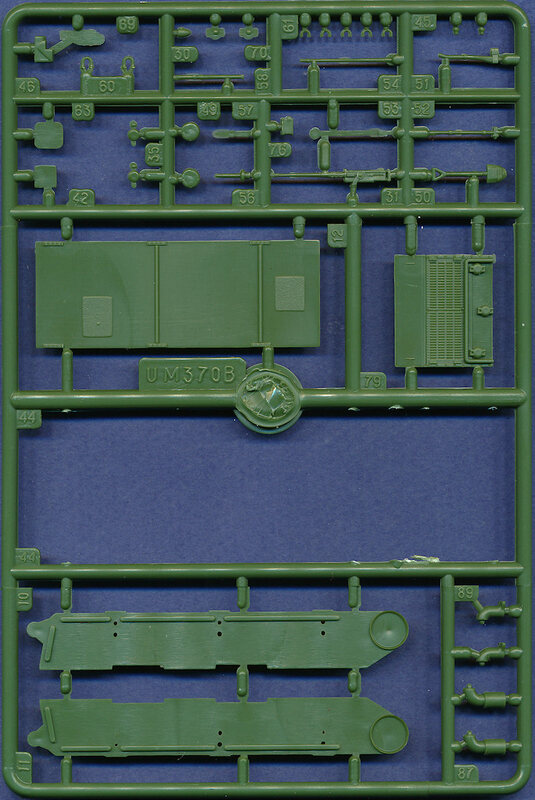 I hope that UM is including this revised wheel sprue with all newly packaged Sherman kits, even re-releases of their older models. 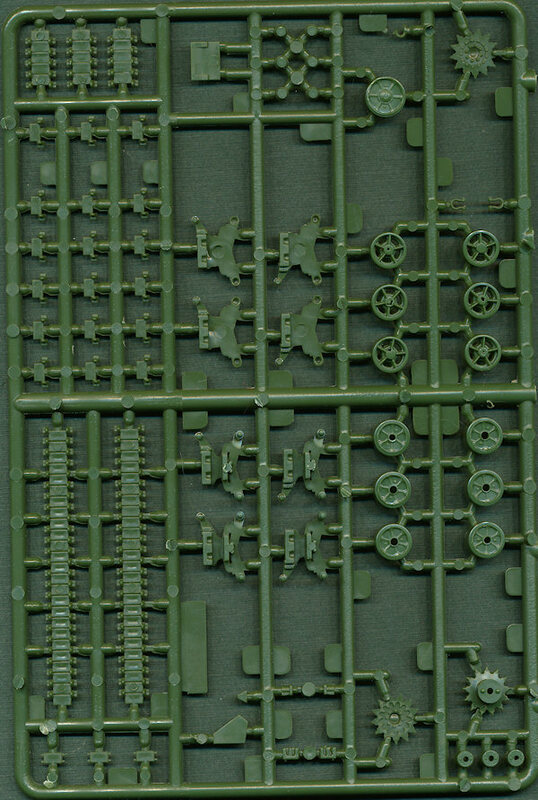 The tracks have not been changed from earlier kits, and most closely represent the T48 rubber chevron style, which was not very common on the M36. 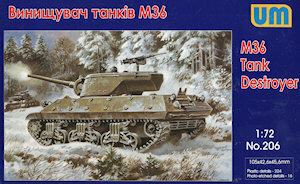 The T51 rubber block style was common on early M36s, and the T54E1 steel chevron style was most common on later M36s. 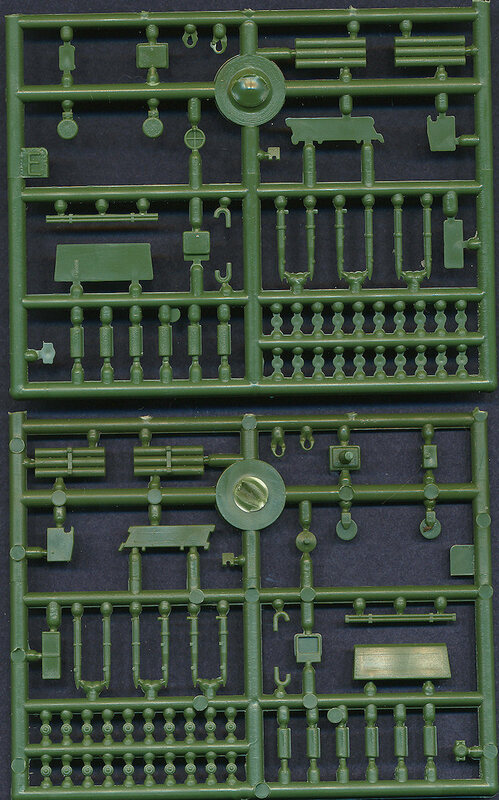 But to be fair, the kit tracks could possibly pass as T54E1s, so it's not that big of a deal. 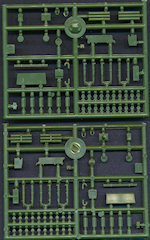 As typical of UM kits, etched parts are included. 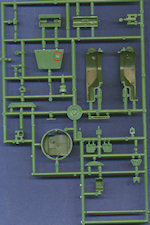 As always, they have included etched track return skids, which is the best way of modeling these parts, in my opinion. 2nd Cavalry Regiment, 3rd Army, Oberwesel, Germany, March 1945. 704th Tank Destroyer Battalion, 3rd Army, France, September 1944. The decals look to be very nicely printed in a single color, so registration is not a problem. 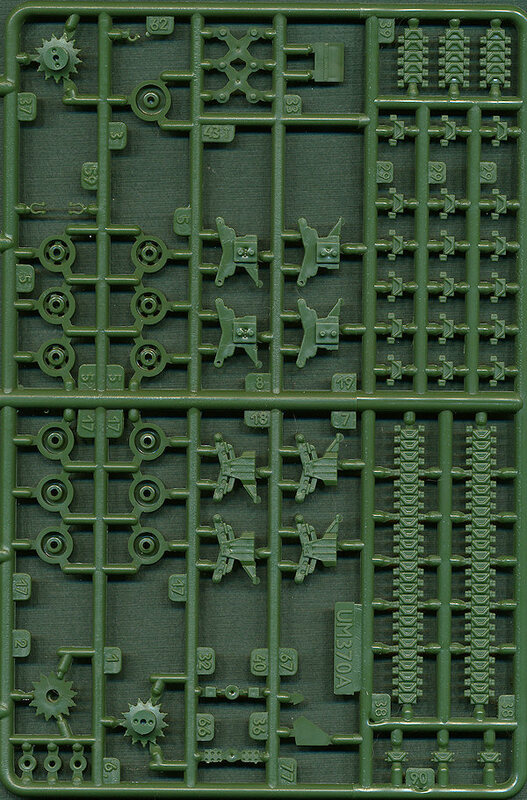 Some general observations in comparison to other M36 kits: Obviously, this one is far more detailed than the Armourfast kit, but I've not seen that kit in hand to comment on the shape of its turret. I believe it uses the same hull as their M10, which is just a hair overscale. The Extratech kit comes in both a standard package and an Extrapack version with numerous resin bits and an extensive photoetched fret. I would say that the Extrapack kit has much superior detail, but the standard kit is probably about on par with this UM kit. 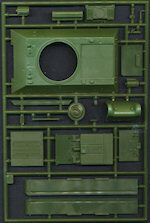 Regarding the scale, this UM kit is the most scale accurate of the three available kits. The Armourfast kit is just a little bit long, and it's upper deck is a little bit longer yet, resulting in angled side plates that are too steep. The Extratech kit is the exact opposite, with the total length being just a little bit short, and the upper deck being even shorter yet, making the angles on the sloped side plates to be too shallow. But keep in mind that we're only talking about 1.0 to 1.5mm off in any given measurement, so all in all, all three of these kits are pretty accurate, and the errors can only be seen when comparing them directly to scale plans, or with each other. But for those of us who like to measure, this UM kit has the best scale accuracy.